A teaching given by Khenchen Palden Sherab Rinpoche and Khenpo Tsewang Dongyal Rinpoche during the Nyungne Retreat at Palden Padma Samye Ling, October 8, 2006. The gracious and kind Buddha gave many teachings on the Hinayana, Mahayana, Vajrayana, and Dzogchen paths. The essence of all of these teachings is to bring more peace, calm, and joy to ourselves and others. This is the heart of the teachings of the Awakened One, and thus every Buddhist practice points in the same direction. But how do we start to cultivate the authentic peace and joy that will result in happiness and benefit for all living beings? We cannot begin this process outside ourselves; we have to begin with our own hearts and minds. The Buddha explained that the genuine starting point of our spiritual path is love, compassion, and wisdom, along with joyful effort. As members of the sangha, we need to remind each other to continually restrengthen these virtuous qualities. In the ocean of Dharma, there are no emergency exits or detours that bypass these beautiful teachings! Guru Padmasambhava repeatedly taught that love, compassion, and wisdom—together known as bodhichitta—are the indivisible nature of the Buddha’s enlightened mind: love is the Buddha; compassion is the Buddha; and wisdom is the Buddha. Chenrezig (Skt. Avalokiteshvara), the Buddha of Infinite Compassion, is the embodiment of these virtuous qualities. Therefore, absolute Chenrezig is none other than love, compassion, wisdom. The figure we visualize during Chenrezig practice is symbolic, yet practicing on this relative manifestation will usher our minds into the absolute state of bodhichitta. Many great practitioners and lineage masters of the past experienced various kinds of obstacles to their practice. However, by receiving instructions on Chenrezig and meditating according to those instructions, they were able to overcome every difficulty and cultivate absolute bodhichitta. These masters eventually became beautiful symbols of love and compassion. By opening our hearts and minds to the lineage blessings, we follow the footsteps of all the noble beings and enjoy the nourishing food of Chenrezig practice, which comes to us like a well-prepared meal. In this way, we ourselves begin to recognize the absolute Chenrezig in our own hearts and minds. The practice begins by visualizing ourselves as Chenrezig. This visualization arises from our strong foundation of bodhichitta, the essence of our love, compassion, and wisdom. All our habit patterns of duality, hesitation, and doubt are overpowered by the absolute state of Chenrezig. As we begin to meditate, it is important to remember that we are not imagining ourselves to be something other than what we truly are; in reality we are reconnecting with our own innate nature, which is like a treasure that has been hidden for quite a long time. This treasure is our buddha-nature, or tathagatagarbha, the essence of all sentient beings. Due to not recognizing the natural state of absolute bodhichitta—our buddha-nature—we have wandered endlessly in the world of duality, the world of samsara. Hence, by invoking the absolute Chenrezig without any doubt or hesitation, these virtuous qualities inherent in us all will spontaneously manifest as our self-visualization. The Vajrayana teachings instruct us to bring forth our “vajra pride” or “vajra confidence” when we visualize ourselves as the deity. This means we are not going to let hesitation and duality undermine and cover up what we really are. For a very long time, our nature has been obscured by the six poisons of (1) attachment, (2) anger, (3) ignorance, (4) jealousy, (5) arrogance, and (6) doubt. The curtains of these six poisons have veiled the wonderful qualities of our buddha-nature, the inherent, absolute Chenrezig. Through our practice on the Buddha of Infinite Compassion, we will eventually put an end to our obscurations and unleash the power and beauty of our primordial nature. Negative emotions—characterized by the six poisons—are the primary cause of the arising of existence in the six realms, and the inhabitants of each of these realms are dominated by a specific poison. For instance, the power of anger arises as existence in one of the hells, and thus hell beings are constantly tormented by anger. Strong attachment arises as existence in the hungry ghost realm, and thus hungry ghosts are constantly tormented by desire and attachment. Ignorance arises as existence in the animal realm, and thus animals are obscured by dullness and stupidity. Doubt and hesitation arise as existence within the human realm, and thus humans are constantly second-guessing, anxious, and worried. Jealousy arises as existence in the realm of the asuras, or demigods, who are driven mad by jealousy. Finally, arrogance is reflected as existence in the god realms, where gods experience long periods of bliss and rapture, only to eventually plunge back into the sufferings of the lower realms at the time of death. The flux of these negative emotions is not limited to this present lifetime, but has continued since beginningless time. As a result, the poisons have gradually become prolonged habit patterns. We have difficulty recognizing ourselves as the absolute nature of Chenrezig, because we have become accustomed to being distracted and overpowered by the strength of the six poisons. Due to these habit patterns—rooted in our misunderstanding of our innate nature—we have created a chain reaction of cause and effect. This causal chain constantly creates karma and propels us into the different realms of existence. On the relative level, engaging in Chenrezig practice will restrengthen and ignite the power of our bodhichitta; in turn, the power of our bodhichitta will reach out to benefit ourselves and all beings of the six realms. On the absolute level, engaging in Chenrezig practice will help us transcend the six poisons and experience realizations we may then share with limitless sentient beings. By helping other beings uncover their intrinsic nature of absolute Chenrezig, we will be able to ease their difficult experiences, bringing peace, calm, and joy to their minds. While visualizing ourselves as the Buddha of Infinite Compassion, we should not perceive ourselves as ordinary, mundane beings in ordinary, mundane surroundings. Rather, we should view our physical form and environment as the body of Chenrezig and his mandala. We should experience our conceptions as none other than the wisdom mind of Chenrezig. And we should hear all sounds as inseparable from the mantra of Chenrezig. In summary: all sights are perceived as the display of Chenrezig’s body; all sounds are heard as the voice, or recitation of the mantra, of Chenrezig; and all thoughts about ourselves and all beings are understood as inseparable from the mind of Chenrezig. Maintaining this view in our awareness, we continually recite Chenrezig’s mantra. This is a brief description of the special Vajrayana teachings on the “three vajra states,” which describe appearance, sound, and awareness as deity, mantra, and dharmakaya, respectively. The condensed, six-syllable mantra Om mani padme hung (pronounced “om mani peme hung”) is associated with all the emanations of Chenrezig. Although initially it may be somewhat difficult to maintain continual awareness of the three vajra states during practice, it is important to recite this mantra without distracting or unpleasant thoughts. Your mantra recitation must be accompanied by an attitude of love and compassion: Simply relax your mind in the natural state of emptiness while reciting the mantra, which is actually the self-reciting echo of great emptiness. This provokes a chain reaction of bodhichitta that extends to all universes and to all beings in the six realms. It spontaneously removes their obstacles, obscurations, and sicknesses, fulfilling all their wishes. Meditating in this way while abiding in rigpa—the state of great emptiness, or Dzogchen—is the practice of Chenrezig. The Buddha’s teachings state that Chenrezig possesses one thousand arms because he is the embodiment of the one thousand buddhas of this fortunate aeon, and his eleven heads are symbolic of enlightenment. Many times we speak of Chenrezig as a bodhisattva, but this doesn’t mean he has not achieved complete enlightenment; Chenrezig is actually a fully-enlightened buddha who, due to his great compassion for all sentient beings, appears to us in the form of a bodhisattva. His eleventh head is that of Buddha Amitabha, signifying that Chenrezig and Amitabha are one and the same, whereas his tenth head is that of Hayagriva, who is the wrathful form of the buddha Amitabha. Again, this shows us that Chenrezig is inseparable from Hayagriva. When we refer to Chenrezig as a bodhisattva, we should understand that this is just one of the many ways to describe him. The word “bodhisattva” itself comes from the Sanskrit words bodhi, or “enlightenment,” and sattva, meaning “courageous one.” Thus, in his enlightened state, Chenrezig is courageous. His love, wisdom, and compassion are indestructible due to this courage: no matter what happens, Chenrezig tirelessly continues to benefit every single being without ever becoming bored or confused. Because Chenrezig continuously cares for all beings without exception, free from hesitation and weariness, he is referred to as a “bodhisattva.” The Buddha’s teachings also state that the great Buddha Chenrezig appeared on this earth in the form of a bodhisattva in order to reach out, protect, and ultimately benefit all beings. Sometimes when we chant the mantra of Chenrezig—Om mani peme hung—we add the syllable Hri, his heart syllable. These six syllables both symbolize and protect all beings within the six realms. Om is an antidote to arrogance and provides protection to all beings within the god realms. Ma eliminates the affliction of jealousy, thus protecting all asuras of the desire realm. The third syllable, Ni, is able to dispel the negative emotions of both doubt and hesitation. This syllable protects human beings from their afflictions within the human realm. Pe is another very special syllable which purifies the darkness of ignorance, protecting all beings within the animal realm. The next syllable, Me, uproots and purifies all forms of greed, thus protecting all beings within the hungry ghost realm. The syllable Hung uproots the negative emotions of anger. As such, it protects all beings within the hell realms. In this way, the six-syllable mantra protects and eases the suffering of beings by purifying the six negative emotions, all of which cause the arising of the six realms. This mantra also purifies the consequences of the six negative emotions, including all the difficulties experienced by the various beings of the six realms. When reciting the Chenrezig mantra, you can visualize that white light emanates from the Om syllable directly to the god realms. Due to the power of the mantra and this white light, suffering within the god realms, and in particular the suffering that gods experience due to their power struggles and subsequent downfalls, is immediately purified and removed. Arrogance, which is the principal cause of suffering within the god realm is also instantly removed. If you can, visualize that with the removal of suffering, the energy of the six syllable mantra continually echoes throughout the god realm, creating a peaceful and soothing sound. From the second syllable, Ma, green light emerges along with the full six-syllable mantra, shining directly into the asura realm. The troubles of the asuras, including their constant arguing, fighting, and quarrelling, as well as their continual experience of anger, rage, and war are instantly removed. Jealousy, the cause of this suffering, is similarly removed. Based upon the power of Chenrezig’s peaceful mantra, the sound and energy of love and compassion echo gently and soothingly throughout the asura realm, showering down countless blessings. While continually reciting the mantra, visualize that peace, joy, appreciation, and calm arises in the hearts and minds of every being in the asura realm. From the third syllable, Ni, yellow light emanates throughout the human realm, instantly removing the principal troubling emotions of doubt and hesitation. Within the busyness of the human realm, anxieties, worries, hopes, expectations, and all similar afflictions are completely removed, bringing forth goodness, calm, and peace. Having thus removed the doubt and hesitation of all human beings, great confidence, joy, and satisfaction arise in their hearts and minds. As a result, all humans abide peacefully and harmoniously, coexisting with great appreciation and love for one another. Along with the continuous recitation of the mantra, visualize that the energy of love and compassion echoes throughout the entire human realm like a peaceful song, showering down infinite blessings. From the fourth syllable, Pe, light blue light emanates to the animal realm and totally removes their suffering, which arises from dullness and stupidity of mind. These afflictions are rooted in ignorance, the primary cause of suffering in the animal realm. All ignorance is completely removed. Imagine that great wisdom arises in the hearts and minds of every animal, in addition to the dense power of love and compassion. As the mantra continually echoes throughout the animal realm, the great blue light of the mantra showers down, uprooting all troubles and difficulties. As a result, all animal beings experience great peace, joy, and happiness. From the fifth syllable, Me, very powerful and soothing red light emanates directly to the hungry ghost realm. The moment this red light and the six-syllable mantra touch beings in this realm, they experience blessings that remove their sufferings related with all kinds of poverty, hunger, and thirst, as well as their tremendous fear, insecurity, and feelings of danger. Visualize that each of these troubles are completely and instantly removed. Attachment and greed, the primary causes of suffering in the hungry ghost realm, are also completely annihilated. Then imagine that all hungry ghosts obtain a great abundance of luxuries, prosperity, and wealth, thereby dispelling all the difficulties associated with greed and attachment. As in the other realms, great love and compassion arise within each being as the mantra resounds, and each hungry ghost uncovers the inner state of absolute Chenrezig. From the sixth syllable, Hung, dark blue light emanates to the hell realms, removing all the sufferings of extreme heat and cold, as well as the painful experiences of terrifying and torturous situations. Visualize that all hell beings immediately become extremely relaxed and happy. Anger, the principal cause of the arising of existence in the hell realms is instantly removed, so that hell beings no longer experience any difficulties; instead, all beings have great confidence, joy, peace, and happiness. Again, the power of the Chenrezig mantra ceaselessly echoes throughout the hell realms, showering blessings that nurture a state of love, wisdom, and compassion. Thus all six realms are transformed into the state of Chenrezig with the recitation of the mantra. Practicing according to these instructions will activate the power of absolute Chenrezig. Of course, in the beginning we may not be able to concentrate on all the visualizations at the same time; but if we can continually focus on the different aspects of these visualizations during our meditation and recitation practice, we will activate its beneficial powers and bring about realization in all sentient beings. Additionally, this practice will invoke the qualities and actualize the realization of Chenrezig hidden within us. By using these techniques for the benefit of all sentient beings of the six realms, we will also sharpen our own realization. As we mentioned earlier in our discussion of the three vajra states, all forms, sounds, and aspects of awareness should be considered the form, sound, and mind emanations of Chenrezig. While relaxing our minds in the present state of awareness, we continually recite the mantra of Chenrezig with the understanding that it is no other than the sound of emptiness. Practicing in this way is the union of shamatha and vipashyana meditation, one of the special techniques of the Vajrayana. Instead of engaging in shamatha and vipashyana separately, we practice them simultaneously and achieve realization that will quickly benefit ourselves and other beings. To summarize, we begin the practice by visualizing ourselves as Chenrezig. This visualization is based upon our indivisible, innate nature of love, compassion, and wisdom—or bodhichitta—which together represent the absolute Chenrezig. Then we invoke the actual living, historical Chenrezig from the pureland of Potala and visualize him in front of ourselves. Next, we perform the seven-branch accumulation practice in his presence. Thus we simultaneously visualize the actual Chenrezig and ourselves as Chenrezig, which helps us easily accumulate merit and purify the negativities. It is important to bring these teachings into a single, beautiful state, and to activate the power of the practice with our devotion, bodhichitta, and confidence. Therefore, we should meditate on Chenrezig without any doubt, hesitation, or conceptualization. Following the instructions in this way, we will be able to benefit ourselves and other living beings. 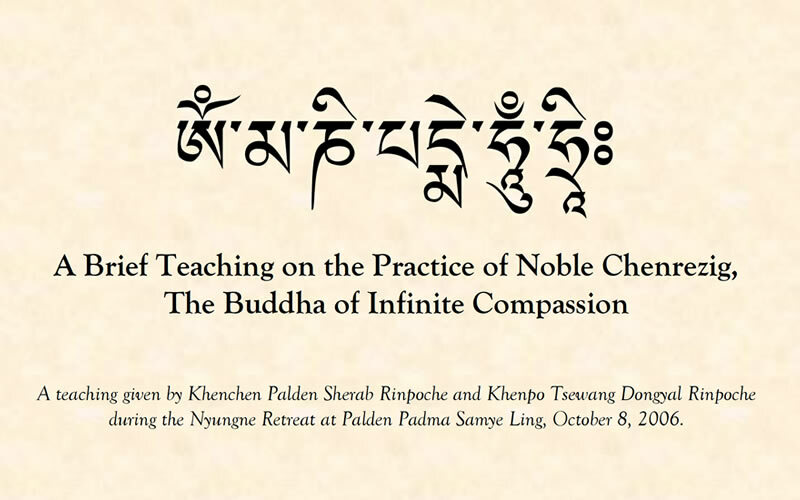 This is a brief teaching on the practice of Noble Chenrezig.